Are you paying UPS or your freight provider extra charges because you don't have correct address information in eAutomate? Check your UPS bill and look for "Adjustment & Other Charges". Perhaps even enter this line item separately with a different GL account so you can see what it's costing you. 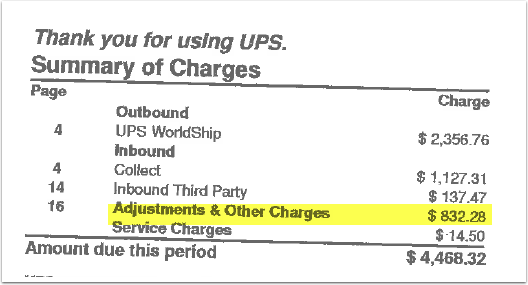 These charges are where UPS can't match the address you have in eAutomate and has to manually correct them. We have heard of scenarios where one township redid a bunch of zip codes, all of a sudden your addresses are wrong! There are address validation firms who provide fully USPS accurate addresses. CEO Juice is looking in to one that can provide us API access where we can push daily updates to your eAutomate. We are checking to see who is interested, have you checked your bill lately? Post below please. CEOJUICE ™ A.I. FOR YOUR DEALERSHIP | 3725 WELLBORN STREET SAN DIEGO, CALIFORNIA 92103 | © 2018 ALL RIGHTS RESERVED.